Bicycles are external, motorcycles are internal. Welcome. Steering bearings on most bicycles are external type, where the bearings lie outside the frame head tube (which is “not stepped”). Steering bearings on most motorcycles are internal type, where the bearings lie inside the frame head tube (which is “stepped”). 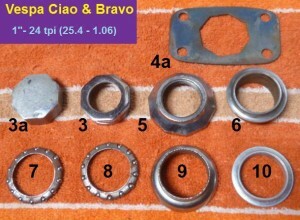 All mopeds have the bicycle type steering bearings, except Derbi, which has motorcycle type. 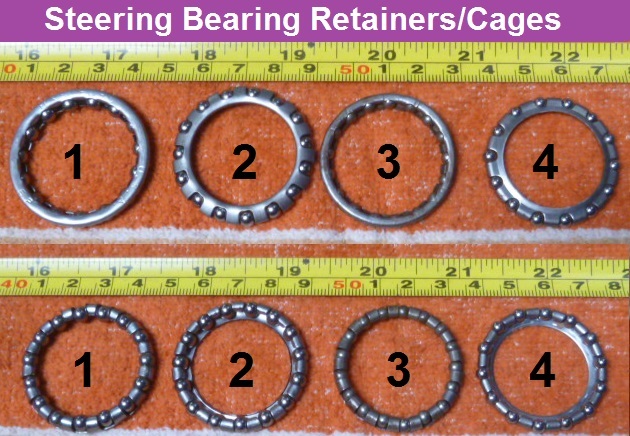 Balls Up or Balls Down is the famous question faced when installing retainer (caged) ball bearings. 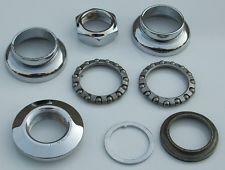 The lower bearing always faces balls down, but the top bearing is sometimes facing up, and sometimes facing down. When it is installed wrong the cage gets crushed. The answer is: the balls always face the “cone” and not the “cup”, regardless of “up” or “down”. Sometimes the upper frame race is a “cone”, sometimes it is a “cup”. Any bearing, when pushed together lightly with your fingers, should feel like the balls are rolling. Nothing should feel like it’s scraping or sliding. When you see the balls rolling at half the rotation speed, and the feel is solid and smooth like an ice cube on a smooth table, then the bearing is correct and good. Caged Balls or Loose Balls can be interchanged. 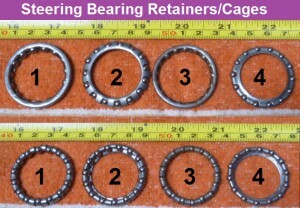 The cage/retainer is a convenience, that keeps the balls from falling out during installation. If the retainers are the wrong size, or bent, but the balls are correct, the balls can be popped out, and installed using grease to hold them. When the cage is eliminated, almost twice as many balls are required, enough to fill the circle with a half to one ball gap. This has another big benefit on worn out races that have dents where each ball was at. When the number of balls changes, say from 14 to 26, the dents do not line up anymore. So it’s almost like having a new race. 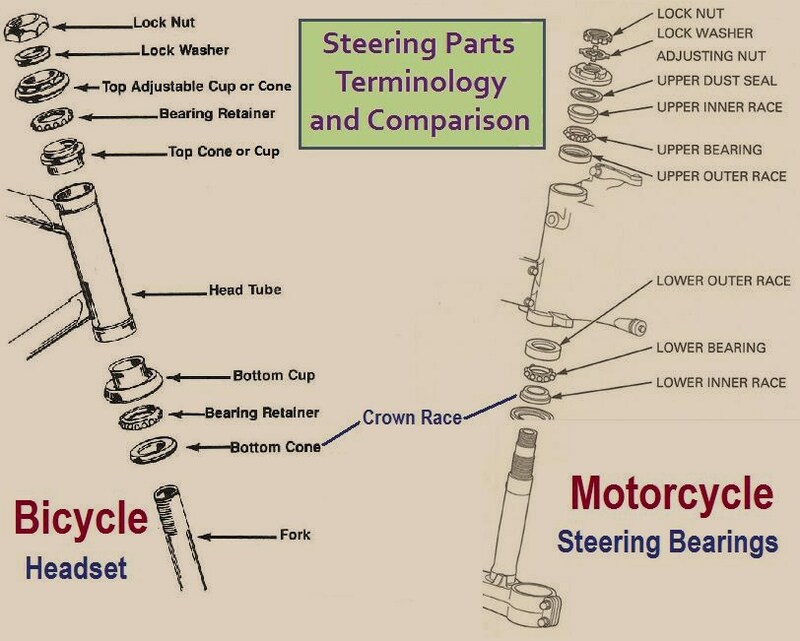 Slight Differences in steering threads have frustrated many bicycle and moped mechanics trying to substitute steering parts from one machine to another. 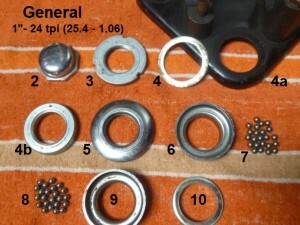 At right is a chart of bicycle headset threads and sizes. 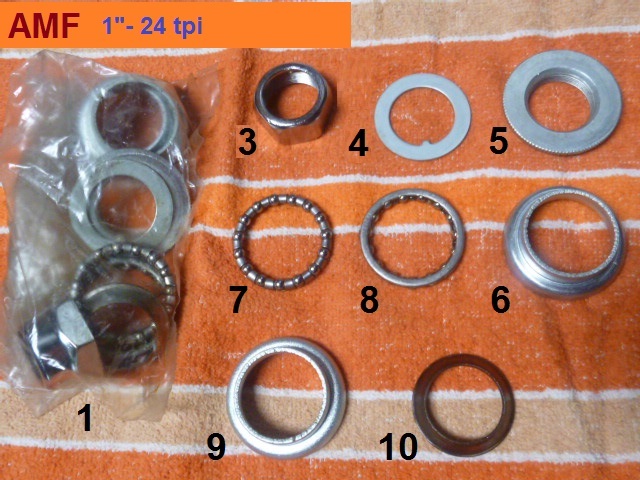 Basically the whole world uses ISO threads, one inch with 24 threads per inch (25.4 x 1.06), except France (25.0 x 1.00), Austria (26.0 x 1.00), Raleigh (25.4 x 1.02), and motorcycles (24.0 x 1.00). None of these thread sizes interchange. They either won’t screw on, or they will screw on loosely, and later slip around and “strip”. Slight Differences in “30mm” frame cups, from 30.0 to 30.2 millimeters, turn out to not matter, ordinarily. Only when the fit is already too loose on a 30.2, or too tight on a 30.0, would it matter. 30.0 replacing 30.2: Take a moped frame that has 30.2 cups and pound one cup out with a hammer and punch, alternating sides. Then take a 30.0 cup and hammer it in. You will only have to strike it about half as hard, because it has a looser press fit. It will hammer out easier. 30.2 replacing 30.0: Take a moped frame that has 30.0 cups and pound one cup out with a hammer and punch, alternating sides. Then take a 30.2 cup and hammer it in. You will have to strike it about twice as hard, because it has a tighter press fit. It will hammer out less easy. 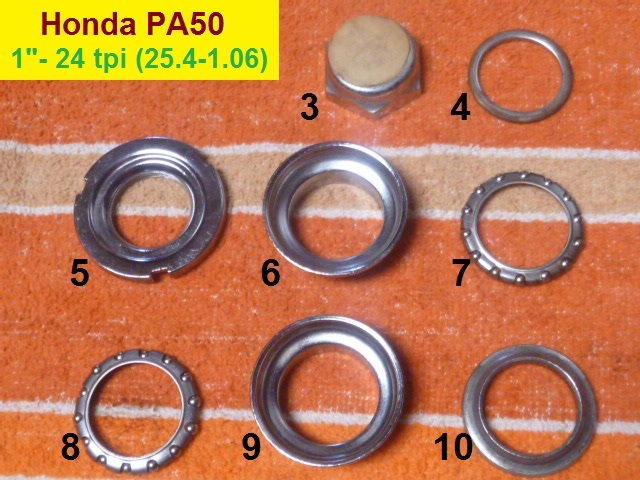 There is much confusion about what is 30mm, the cup outer, or the frame inner. A frame for 30.0 cups can be 29.7 to 29.9 mm inner diameter (id). A frame for 30.2 cups can be 29.9 to 30.1. Some cups are made in between, 30.1 mm. The cups for sale below are classified as “30.0 cups” if they measure 29.9 to 30.15 mm. They are classified as “30.2 cups” if they measure 30.16 to 30.25 mm. Slight Differences in “32.5mm” frame cups, from 32.5 to 32.7 millimeters, turn out to not matter, ordinarily. They range from 32.5 to 32.7, with most around 32.6. For traditional American bicycles, AMF, Colombia, etc. 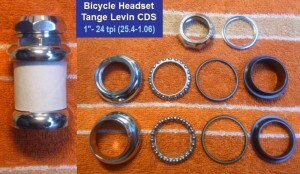 For traditional Schwinn bicycles, BMX, and low-end ATB. 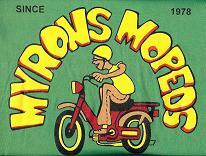 For traditional ten-speed bicycles, standard bikes, childrens. A good substitute for the European 14 – 5/32″ ball retainer. This is like a #73 retainer with an inner lip for stiffness. 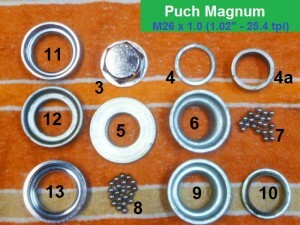 1 5/32 inch (#5) balls (3.97mm), pack of 26 $2 26 loose 5/32″ balls can replace a “Euro” 14-ball retainer. For light duty moped and bicycle headsets. 26 loose 5/32″ balls can replace a #73 16-ball retainer. 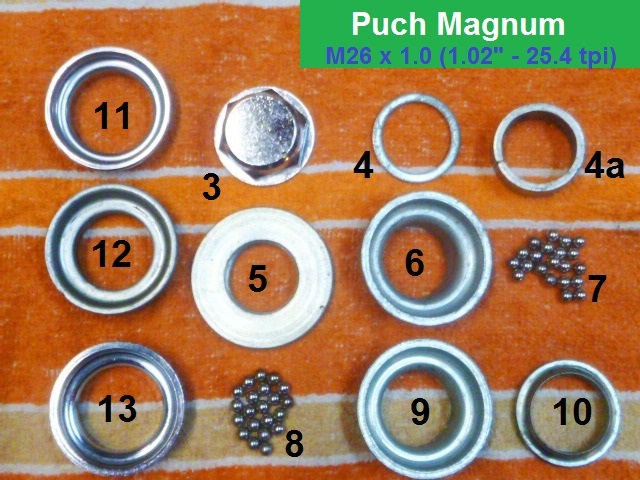 2 3/16 inch balls (4.76mm), package of 26 $2 22 loose 3/16″ balls can replace a #65 15-ball retainer. For Puch Magnum, Sears Free Spirit, and Tomos. More balls, or bigger balls, can carry more weight. In ascending order of thread size (fork), then cup size (frame). After years of ignorance and misunderstanding, moped headset items have been identified, measured, verified, and presented below. With these measurements and specifications, it is possible to find correct replacements by measuring their sizes precisely with a calipers or a micrometer, and then matching it with the pictures and or brand names below, hopefully. These things have to be somewhat precise. If something is too tight it might not go on. If it’s too loose, or mismatched, the bike might be difficult to control, or be unpleasant to ride. Derbi mopeds have internal steering bearings, like motorcycles have. You can see on the Derbi at the right, the bearings are not visible. But on the Sparta Foxi on the left, the steering bearings are visible above and below the frame head tube. The Sparta has external steering bearings, as do all other mopeds. Japanese motorcycles usually have this 24×1 thread on the top nut, but further down the steering tube steps up to 25×1 or 26×1 or bigger, where the bearings go. 5a This little “nub”, from Peugeot bicycles, must be ground off. 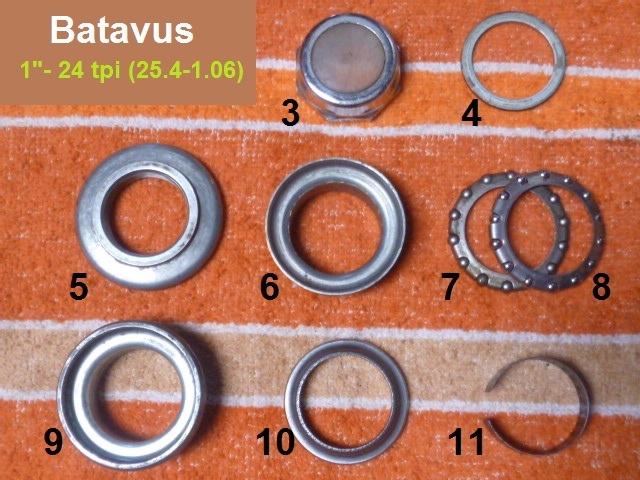 5a It goes into a ring of holes, a special “holey” washer, not #4. 30.0 cups will replace 30.2 ones. They just press in easier. 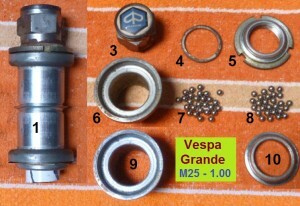 Vespa Grande headset is unique, heavy duty, French thread. The Grande crown race is only 25.6 id, and the fork is 25.7. The Honda PA50 Hobbit (Camino) is made in Belgium. It is mostly European in design and components. This is the original crown race size. It was loose on the fork. Three samples of Honda PA50 original forks were like this. The fork steering tube is a straight 25.4mm all the way down. So there needs to be a 0.15mm hard steel strap under the race. The bottom side of nut #3 has a lip that fits inside #4a. That’s why the holes in #4 and #4a are big, 32 not 26.
instead of the fork top pressing on the threads directly. 1960’s small Honda motorcycles had this design. Asian mopeds use the Japan Industry Standard (JIS). General, Lazer, Grycner, Clinton, Jui Li, AMS, Tas, Tym, etc. JIS stands for Japan Industry Standards. JIS crown races are 27.0 id, for a 27.1 fork. JIS frame cups are 30.0, for a 29.9 frame. 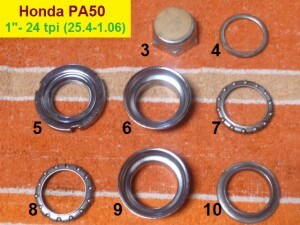 ISO cups are 30.2 mm o.d, for a 30.1 mm i.d frame. ISO crown races are 26.4 id, for a fork crown 26.5 od. Batavus mopeds are made in Holland. The fork steering tube is a straight 25.5mm all the way down. The strap crushes to 0.5 mm, so it adds up, 26.5 = 25.5 + 2*0.5. 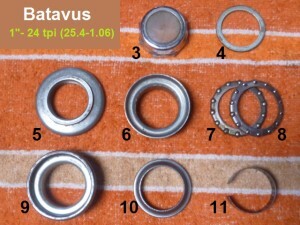 The ideal spring strap for Batavus would be 0.5mm. 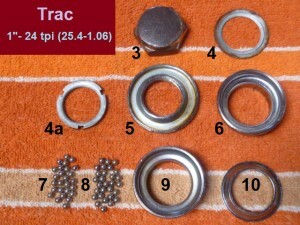 Trac mopeds are made in Korea by Kia and Dae Lim (DMC). This example is for the early Tracs 1982-85 with M56 engines. 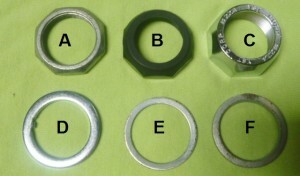 4a 90304-M56-8900 notched thin nut N/A use octag. This is the original crown race size, but it was loose on the fork. The fork steering tube is a straight 25.4 mm all the way down. The looseness had caused a 25.3 mm wear groove on the tube. To be tight it needs a spring strap and a bigger race, like Batavus. 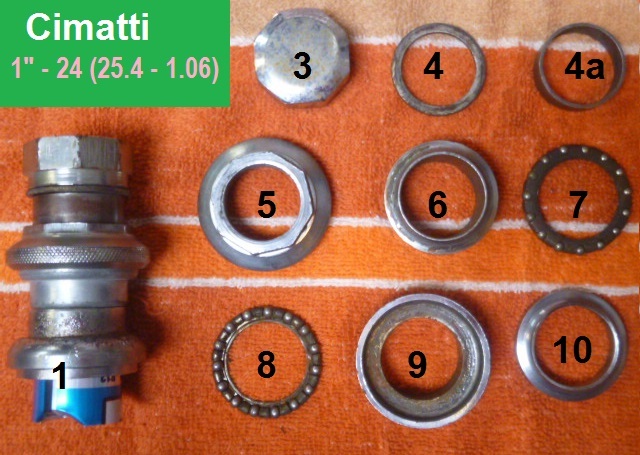 Cimatti’s are Italian, and use Italian headset standards. Cups are 30.2, for a 30.1 frame. Same as bicycle. 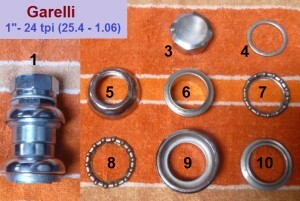 Italian crown race is 26.5 id, for a fork crown 26.6 od. ISO (International Standards Org.) threads are 1″- 24 tpi. 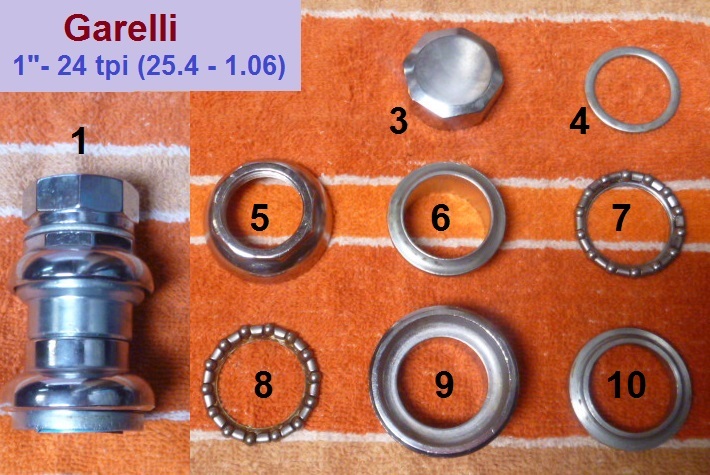 Garelli’s are Italian, and use Italian headset standards. because Kynast (Flying Dutchman) has an Italian fork. Vespa mopeds are made in Italy by Piaggio. 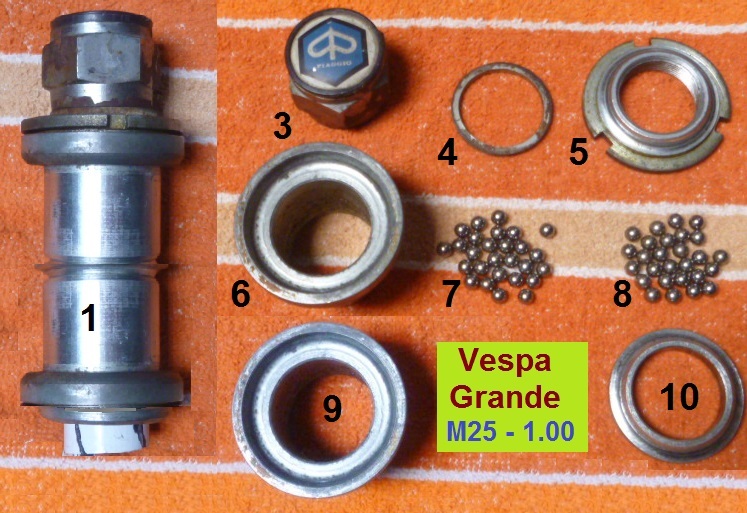 11 Vespa uses Italian headset standards, 26.5 and 30.2. 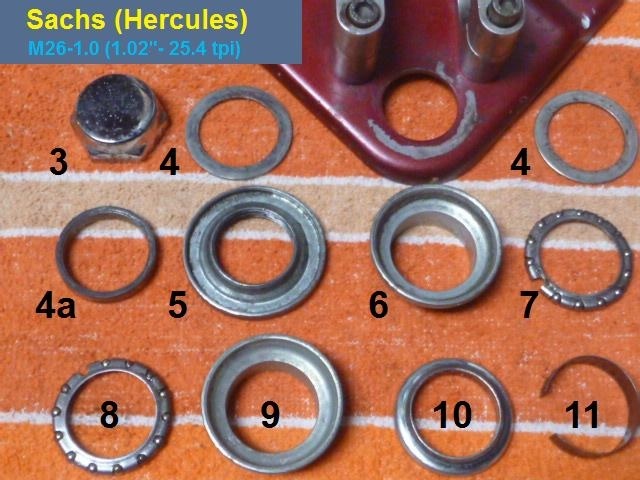 In the 50’s – 60’s USA this was a Schwinn-only head set size.In the late 1960’s BMX (bicycle moto cross) began. 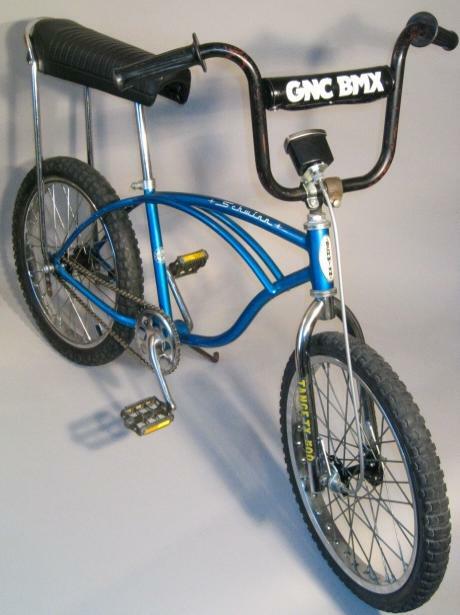 The first BMX bikes were 20″ kids bikes with off road tires, MX handlebars and seat. The Schwinn Stingray was preferred, because of it’s heavy duty construction and high quality. In the 70’s BMX equipment became Schwinn-compatible, including frames with 32.5 mm headset cups. 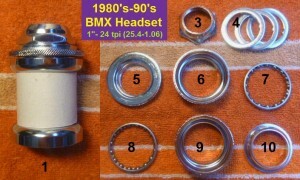 BMX became very popular, as did the headset. In the 80’s it became the mountain bike (ATB) standard. 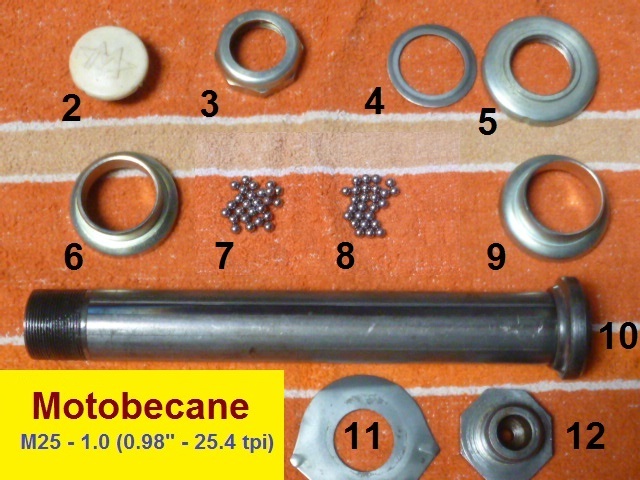 In the 1990’s bigger 1-1/8″ steering tubes came out on high-end ATB’s, with 34.0 frame cups. Soon 34mm frames became the new ATB standard. Then bigger 1-1/4″ steering tubes and 37mm frames followed. Now this historic headset is almost obsolete. This is a 1980’s-90’s BMX or ATB headset, 32.5 cups. The cups fit Puch Magnum, Tomos and Sears Free Spirit. For 50 years these had #65 retainers, with 3/16″ balls. 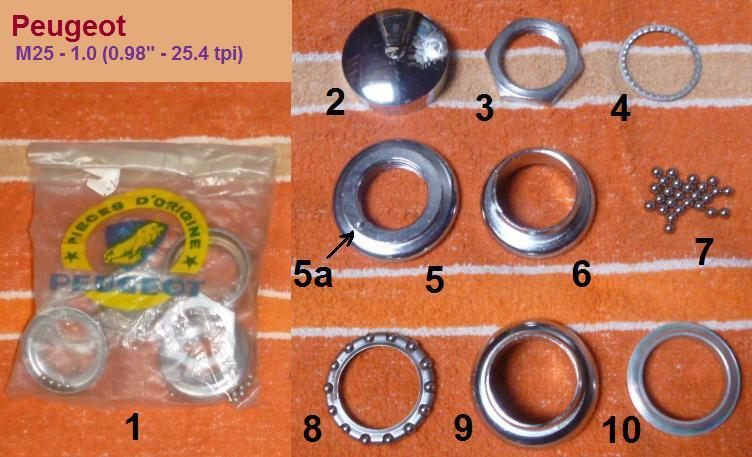 This chrome crown race is labeled Ø26.4. The fit, roundness and finish are surprisingly good. This standard is on AMF, Colombia mopeds and bicycles. Also traditional American bicycles, Murray, Huffy, etc. 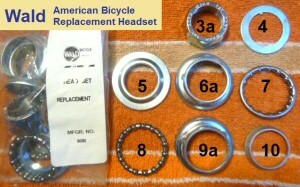 Wald 4080 headset is for traditional or vintage American. The Wald 410 replacement frame cups have 3 “bumps”. The diameter is 32.9 mm, but 34.3 mm at the bumps. Grind them down to fit any frame from 32.8 to 34.2 mm. American Crown Race: Unlike other fork crowns that have a small step at the base of the steering tube, American type bicycles have a smooth flare. The race #10 only touches at the top of the flare, and at the bottom floor of the fork. You can see in the right photo the crown race is cone shaped inside. All other crown races are cylindrical shaped inside. If an American type conical crown race is not available, then a 26.4 mm id standard crown race will substitute (at least it did on this fork), thanks to the bottom having enough straight section that is 26.5 mm outer diameter. It sounds crazy that a 26.4 race will substitute for a 25.5 one. That is why this explanation and pictures are needed here. The Puch Maxi headset is the same as Sachs (Hercules). 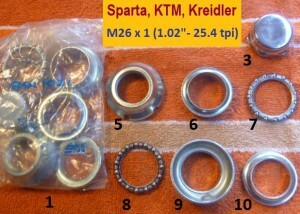 These sizes are the traditional Austrian bicycle headset standard. The 1984-86 Puch Cobra, was a “Magnum”, but it had this Maxi headset. 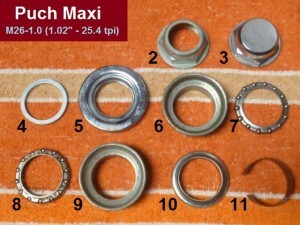 The Sachs headset is the same as a Puch Maxi headset. This nut bottom is cone shaped, for centering, like a lug nut. New crown races range from 26.65 to 26.74 mm id. Tomos made Puchs, under license, from 1955 to 1974. That is why the steering parts also fit Puch Magnum. 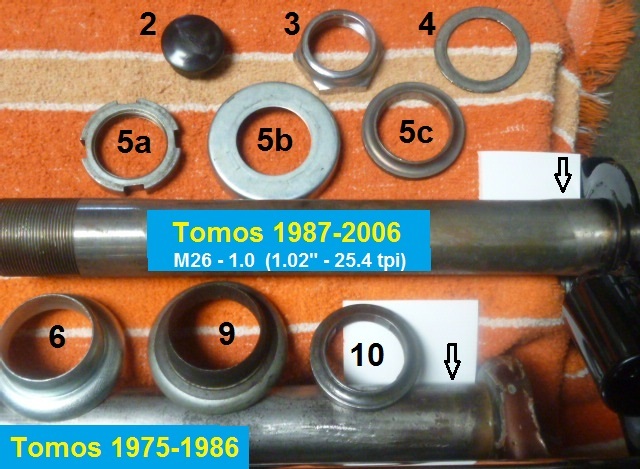 The 1987-06 Tomos fork has M26-1.0 rolled threads 25.8 od, then smooth 25.1 od, flaring to 26.1 at arrow. 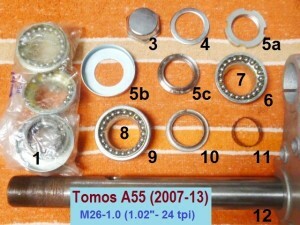 The 1975-86 Tomos fork has M26-1.0 cut threads 25.8 od, then smooth 26.0 od, flaring to 26.1 at arrow. 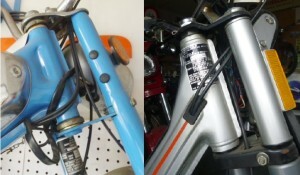 The 2007-12 Parts Catalogs only have the older fork items. So the 07-on EBR fork items, 10 and 11, are not available. The strap crushes down from 1.0 to 0.7 when installed. So 27.4 = 26.0 + 2*0.7. Ideal strap is 0.7mm thick. 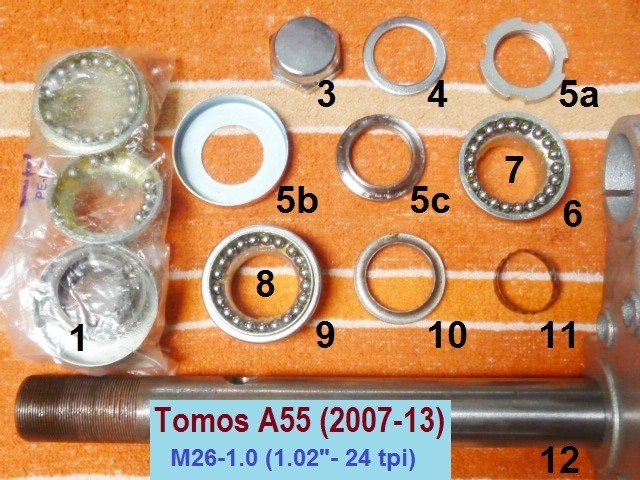 The 2007-13 Tomos fork has M26-1.0 cut threads 25.8 od, then smooth 26.0 od, with no flare. Instead of a flare or step, it has a #11 spring strap, the same one that a Puch Maxi has. This futuristic early 1980’s moped has a bigger steering tube and bearings. EC34/30. This (1.125″) was the first oversize for 1990’s mountain bikes (ATB), 34.0 cups, 30.0 crown race. EC37/33. This (1.25 inch) is the biggest external cup (EC) threaded bicycle headset, 37.0 cups, 33.0 crown race. You are currently browsing the archives for the Steering category.